A hurried replacement also called the Theatre Royal was built at the top of Longbrook Street. With a capacity for 1,500, the theatre was built with little regard to fire safety - lessons had not been learned. 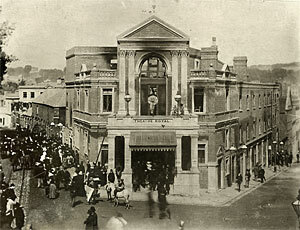 The Exeter Theatre Company moved in during 1886. On the 5th September 1887, on the first night of a romantic comedy called Romany Rye, and with an audience of 800, a naked gas flame ignited some drapes in the flys. Within moments, panic broke out as the flames spread. There were 186 victims, many from the upper gallery who could not escape because of poorly designed exits - many victims were suffocated in the crush. This disaster was the worst theatre fire in British history, and soon, Parliament legislated to bring in stringent safety precautions in all British theatres, including the fire proof safety curtain. Go to Theatre Royal fire for more on the fire. The second Theatre Royal after the fire in 1887.